Kristel Cuenta, writing in SearchEngineWatch.com, says that any piece of content that gets a good response from the target audience should be repurposed into other forms of content in order to leverage the popularity and keep the target audience engaged. This is a very good way to approach content creation. We would also like to suggest one simple adaptation to this idea: instead of creating more content for inbound marketing, create content that your direct sales force can use. If you own a business-to-business (B2B) company, you probably have direct sales people; either on-the-street people or phone sales people. These men and women are always looking for any kind of excuse to contact a new prospect or re-connect with their current customers. Giving them content that they can hand out will let them do that. Interactive content. Online quizzes, assessments and calculators. The sales force can send their clients to these online tools in order to build the relationship. Video. Turn the written content into a short educational video. The video file can be placed onto your website or put onto a jump drive to hand to the client. eBooks. Expand the content a bit and create a quick-read ebook. It can be printed or put onto a jump drive to be handed to the client. The beauty of this is that links to your website can be included in the ebook. So if you create a popular piece of content, do not let it fade away. Repurpose it for the sales force. Doing so will build long-lasting customer loyalty. You can read Kristel’s article here for more ideas. 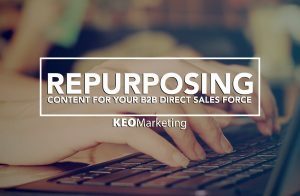 As a leading inbound marketing agency, KEO Marketing can help you repurpose content and utilize other innovative and cost-effective content marketing methods. Contact KEO Marketing or call us at 888.702.0679 to learn more. Don’t Bore Your Audience Online!